Hardy fuchsias are a great addition to Pacific Northwest gardens. They bring color and interest to the garden throughout the summer and into late fall, and are a draw for hummingbirds, dragonflies, and bees. And growing them is easier than you think! 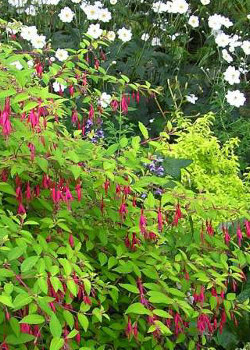 When selecting hardy fuchsias in the spring, choose a plant that is healthy and has no blooms on it. A plant with no blooms means that the plant can concentrate on developing a good root system rather than expending all of its energy on blooming. 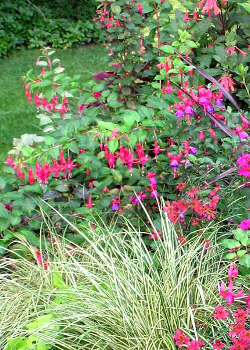 When selecting hardy fuchsias in the fall, try to find a plant that is quite large and is in at least a one-gallon pot. This provides plenty of material to plant deep in the ground, so that the plant can establish quickly. Hardy fuchsias like at least 6 to 8 hours of sun in order to bloom properly. They can be grown in part shade, but will not bloom as much or live long in dense or heavy shade. 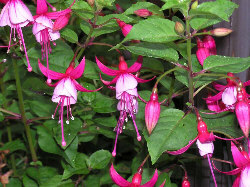 Most hardy fuchsias do not like wet feet, so look for a location that has well-draining soil. If you buy a plant that is in a large container, such as a one-gallon pot or larger, plant it like a tomato, as deep as you can get it into the ground, being sure to leave at least two to three sets of leaves above the soil surface. Each leaf node that is buried in the soil will produce new roots and shoots, giving you a bigger plant while helping the plant to establish more quickly. When planting in the spring, I do not recommend planting a fuchsia before May 1st, unless we are having a very warm spring. Be sure to protect the plant from late frosts. A light sheet will do for cover; you just have to keep frost from touching the newly planted material. When planting in the fall, try to plant before October 1st, so that the plant has time to grow some roots before the first hard frost.